The best result of a hair transplant should be assessed after one year after the procedure. Hair transplant is the surgical procedure for getting your natural hair on the sites where you have lost your hair. Hair roots or grafts are extracted from the back of the scalp and is implanted in the front area of the scalp. These hair roots start growing with the normal growth rate after 3-4 month of the procedure which is 1 cm per month. So if a person is keeping his hair around 8-10 cm in length than at least 8-10 months are required after the hair transplant to achieve this length. Also, some of the follicles may be in a dormant phase when implanted so they may start to grow after some months. 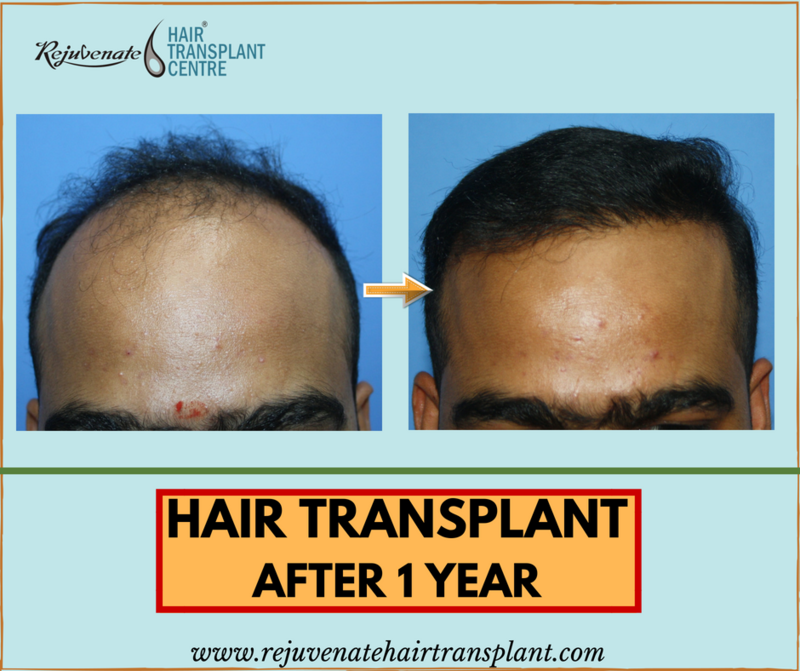 Here we are presenting an interesting case history of the patient operated at our Clinic-Rejuvenate hair Transplant centre who got a very good result of Hair Transplant in just 8 months 9 days. A young fellow of just 24 years ago and is a software engineer by profession. Maybe because of the stress associated with his work and strong family history he is suffering from grade V baldness at such a young age. He was very much disturbed because of his hair and had taken treatment at various places, now he wants Hair Transplant. We planned for FUE of 3000 grafts with the safe zone of the scalp as the donor. Routine Pre-op investigation were all within the normal limit. He is a non-smoker, has no history of any drug allergy, convulsion or any other disease. As a routine, we advise him to stop multivitamins a week before the surgery. An oral antibiotic is given a day before surgery. On the day of surgery, we advise him to take a good sleep and come after breakfast. Xylocaine sensitivity is done. Vitals are recorded and extraction is started after giving local anaesthesia. We start extraction simultaneously from left and right side of the donor area. This is a big advantage as if two surgeons are doing extraction simultaneously since it reduces the overall time of extraction and of the surgery. To reduce out of body time of graft we extract grafts in two sessions, Half of the graft are extracted and implanted before lunchtime. The remaining half of the grafts are extracted after lunch time. This policy of doing hair transplant in two sessions also reduce fatigue of the surgeon and technicians. So we extracted 1650 grafts in 45 minutes. Then after implantation of these grafts and lunch break, we again started extraction. This time we take out 1500 grafts in 40 minutes. As a standard procedure and as a member of ISHRS we believe in ‘surgeons should do the extraction, not the technicians’.Extraction of the graft is the most important step which requires precision and if not done by an expert surgeon than transaction rate will be high. This not only affects the result but also damages precious permanent zone of the scalp. Acceptable transaction rate is up to 10 % but at our centre, it is only 2-4 %. Grafts are stored in the plasma so as to provide them with nutrition as well as to keep them in an atmosphere which is more biological. Also, grafts when coming in contact with the plasma they form a clump because of the formation of fibrin plug, it helps them to be protected from drying also. Implantation is done by the trained technicians by “no touch to root technique”.This is the method of implantation where even microtrauma to the grafts is avoided. This is also one of the important factors for deciding growth and thickness of the follicle. Total 3150 grafts are implanted. Usually, grafts from the scalp contain 1-4 hair. In this case – one hair grafts were 450, two hair 1935, and 3 hair grafts were 765. Try to sleep in normal face-up position for the first two days to avoid swelling. Don’t rub or massage the recipient area for first 8-10 days, as there is a possibility of removal of grafts if you do this by force. After 10 days grafts are well adhered to the surrounding tissue and will not come out even after rubbing. Avoid heavy exercise like weight lifting for 2-3 weeks. On comparing his hair transplant result before and after Images on follow up at 8 months and 9 days he was so happy. At our centre, we usually get good results only in 7-10 months. This is possible only because of the quality control at each and every step of hair transplant. Trauma to the graft during extraction of the follicle is avoided, Transaction rate is kept at the minimum. Microtrauma during Implantation due to improper handling is avoided by using no touch to root technique.